Support multi-zones control. 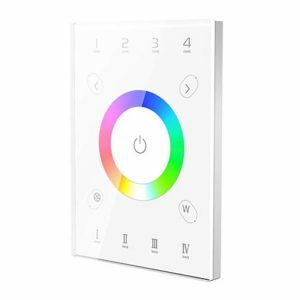 Based on 2.4GHz: Controller control the LEDs by the wireless zones receiver, base on 2.4GHz wireless control, no wiring trouble, user experience the free and fun of the wireless control! 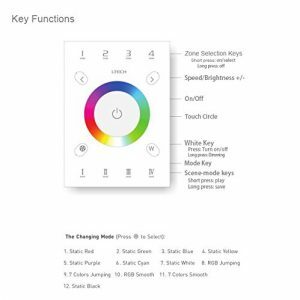 DMX512 Output: Support DMX512 output, can be used as a master, control DMX lamps. T-PWM dimming technology/ 4096 gray scale. 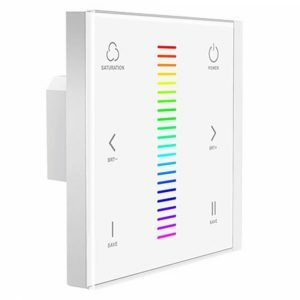 Support several panels to achieve multi-connected control. High-grade tempered glass panel. LED night indicator. Installed in standard 86 boxes. Latest human detection design. Capacitive touching sensor. Humanized touch circle. Touching along with chord music. NOTE: DX8 is ONLY suitable for the receivers, R4-5A and R4-CC. 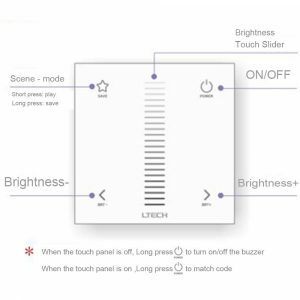 If you want to control RGB/RGBW LED strip by DX8 touch panel, you need R4-5A CV receiver . 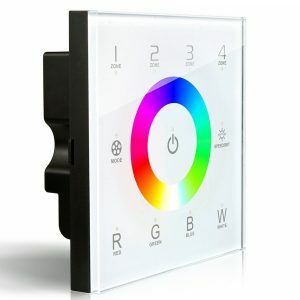 If you want to control RGB/RGBW LED panel light by DX8 touch panel, you need R4-CC CC Receiver. Input Voltage: DC12V-24V. Load Current: 4A*2CH Max 8A. Max Output Power: 96W (12V), 192W(24V). High-grade tempered glass panel. Humanized touch circle. LED night indicator. Latest human detection design. Capacitive touching sensor. Touching along with chord music. Scenes Save & playback, Users could save the designed lighting effects anytime, anywhere for playback next time. 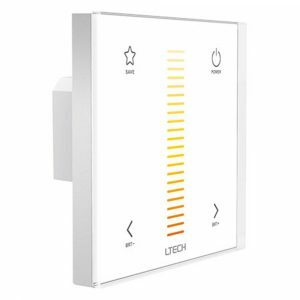 RF Wireless: Touch panels can be sync controlled by mutil remotes; The same panel can learn from each other, to achieve synchronization control. Zone Control: Support 4 zones separately to meet different control demands. 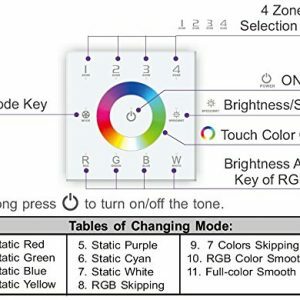 Changing mode: Multiple changing modes:static, dynamic, 7-color gradual, jump and so on.